What do you do all day with a day off?? I have this entire week off from work. In fact, I have accrued so many vacation days that if I don't start using them I will not get more, so I am taking time off. I will go back on Monday. So you ask? 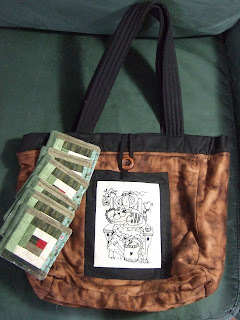 (even if you didn't I am going to tell you) what do you do with all this time off and no sewing machine? Well, I have been cutting like a fiend! 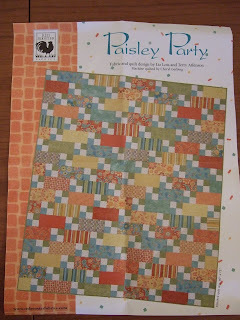 I bought this kit with Paisley Party fabric this week and now the quilt is all cut out. Aren't these fabrics pretty? Kind of reminds me of Fresh Squeezed. This is the pattern. 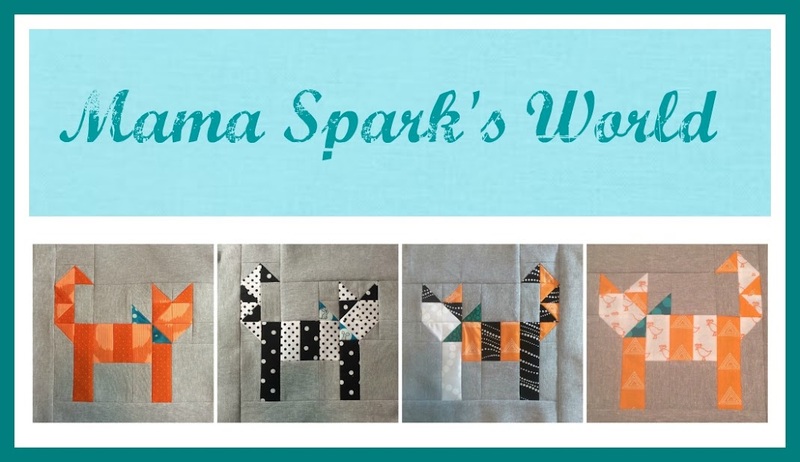 It is a fairly simple quilt but really nice when done up. I have also cut out a baby quilt using my Posh charm squares to make a basket quilt for my SIL's upcoming baby girl. I will take photos soon so you can see that one too. I have a few more things to cut up too. When that sewing machine gets out I will be so busy! 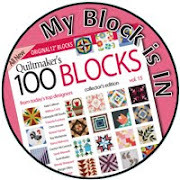 Oh, yeah, BTW, I have one more day to write on my 365 day challenge quilt blocks and that will be finished. 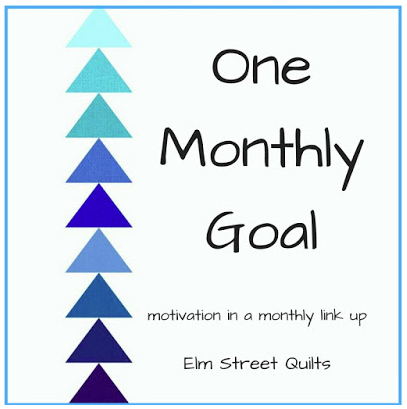 I was telling DD2 about this feat of chronicling my life for a whole year on a quilt and she said to me, "You know that you need to make 2 more of those so we can each have a year of your life in a quilt, right?" Yeah, right, I told her that's what this blog is for!! I think many of you know that I am owned by 5 cats and a dog. It should therefore be no surprise that there is always pet fur on my quilts. I try really, really hard to keep it to a minimum but the cat inspectors believe, quite strongly I might add, that you are not truly finished with a quilt unless there is cat fur quilted into the quilt. 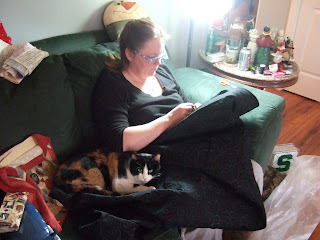 Here is Hallie putting her fur of approval on the *BLACK* back of Amy's quilt...Thanks, Hal! Don't you just love my $1 Target special magnifying glasses?? Quite fashionable, or so Hal tells me. I hope you all are planning a safe but fun New Year's eve celebration. DD2 and I went out shopping today for something flashy for her to wear to her party tomorrow night. One last thing, DD2's BF is coming over tomorrow and I will finally get to give him his MSU quilt. I sure hope he likes it! 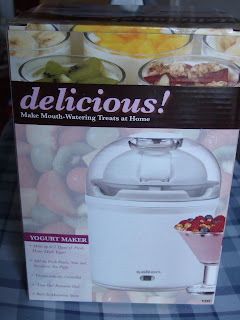 I thought you might like to see what I got for Christmas. 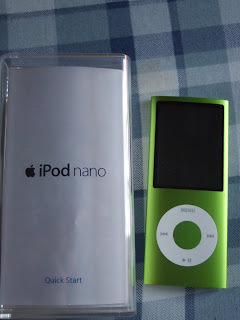 One of my favorite presents was this iPod Nano. My DH is still trying to get it to work, but I am hopeful that soon it will be working. 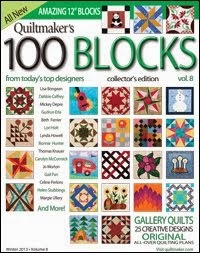 My BIG goal is to be able to "read" while I quilt. That would be amazing!! My daughter got me this book by Lynette Anderson. 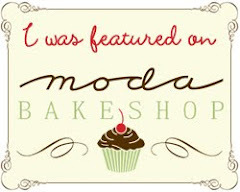 If you don't know who she is go and take a look at her blog. She is so talented. 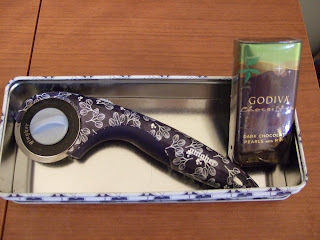 Santa brought me this cutter by Gingher and the Godiva mints. What do you think he wanted?? For some reason Blogger is being weird and won't let me upload any more photos at the moment so I will just tell you the rest. DH also got me the 4th season of Stargate Atlantis on DVD. My DD2 got me some unmentionables from Victoria's Secret and some perfume, my DS bought me a book and then there were a few incidentals but I think all in all I had a very very good Christmas. It was nice that my dad and sister were here too. Did I tell you that I finally gave her the quilt at Thanksgiving? Well, I did and then I gave her the throw pillows and pillow cases I made to match the quilt for Christmas. I hope Santa was good to you all too! It was Christmas morning and DD2 was opening her gifts and what do you suppose she got from mom and dad? Why a Galapagos Island Kelsey!! (Really a Barbie that I changed to fit the occasion, LOL) She thought it was cute. 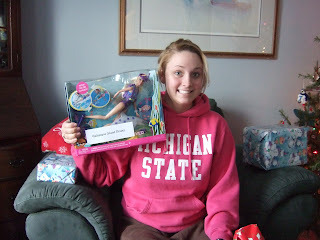 The highlight of her Christmas was her new underwater camera!! I have had loads of people asking for photos of the antiques I got in Holly so here they are. I got these in my stocking. 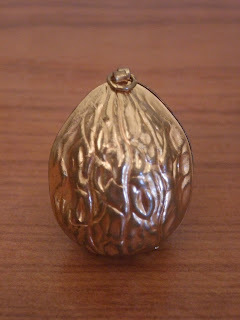 This is a walnut sewing case. It is the size of a walnut. It is metal on the outside and lined with velvet on the inside. Inside you can see a thimble and a needle. 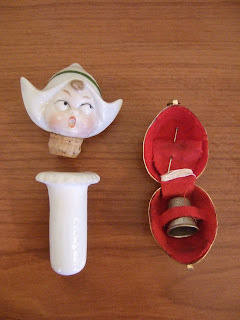 (I beleive Mrs. Goodneedle has one of these) In addition I got this cute(I mean creepy) little Dutch girl porcalin needle case. (Annemiek, is this what the needle cases look like over there??) I love them both. 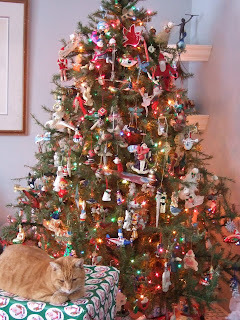 This is a photo of our tree with "Jack on a box". Now you are in for a treat. 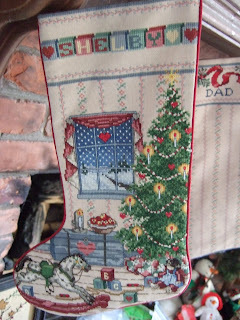 The story of the Christmas stockings. 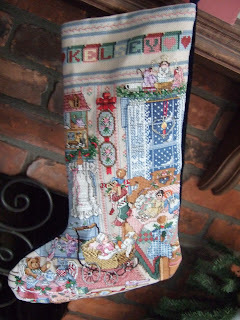 When my DD1 was born I made an elaborate cross stitch stocking for her and it is beautiful. It took a LONG time to make, but what the heck it was just me and DH then so it was ok. 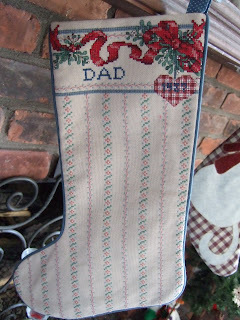 FINALLY FINISHED THE STOCKING!!! Here it is to prove that I finally did it. I didn't tell her, I just hung it up so she found it on Christmas morning!! I really do love my son, but there is no way in Hades I will EVER make another one of these! I have my Christmas gifts to share but I need to go and do some laundry and run some errands, so maybe later today!! My DH always complains that we dont't do the things he wants to do over the Christmas holidays. He LOVES to go to certain places and Holly Mi is one of them, for the Dickens Festival. I think it was 20 degrees below zero on this day but he and I and DD1 all went to Holly with him. 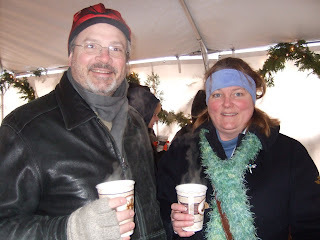 Here are DH and I in the refreshments tent drinking hot mulled cider. We had fun but it was very COLD! There are a lot of antique shops here and I picked out 2 really cool antique sewing implements (which I ended up getting for Christmas, but that's another story). Also before Christmas we were asked by the CHV theater (where we quilt on Wed nights) how our craft show sales were at the STAB craft show. They were just OK, so the woman running the CHV Theater asked us if we would like to set up on the nights of the Christmas Extravaganza to sell our wares. This was the Thurs, Friday, 2 times on Sat and then on Sun before Christmas. Of course we said yes! So here are a few photos of Charlotte (I was taking the pics) at the CHV Theater. We had lots of room and did fairly well with our sales (over $500) for a few hours each day, which was better than the craft show! There was a very nice note and it explained why her gift was late. It really was not late as it arrived well before Christmas! 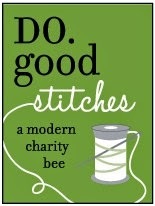 Her blog is called Itching for Stitching, isn't that so cute?? And a proper cat lady on the other side! Again, I think she knows that I have 5 cats! I love the bag, it is just beautiful. Her stitchery is so much better than mine! So she also included these fun coasters. I just LOVE them!!! My DH is constantly asking me to make a log cabin quilt for him and now Dawnie sends so many mini ones. AWESOME!!! 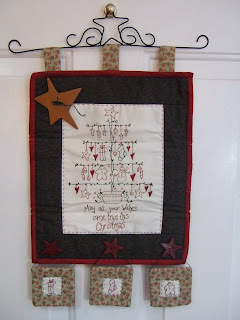 Then she sent this beautiful wall hanging. I immediately put it up on my front door. She included the wire hanger too. Isn't she just so clever? The sitiching is just fabulous. Then since she could not find buttons that suited what she wanted she used ceramic ones and painted them. (I need to be careful not to drop this or they may break!!) Oh please enlarge it and look at the beautiful detail!! I hope everyone had a great holiday, Christmas or otherwise. I have lots more to share so will do so later. Hey there. I wanted to take a minute to let you all know that I gave my friend and neighbor the polar bear quilt last night. She cried!!! She was so surprised and thrilled. She could not stop looking at it and would not let it go or share it with anyone in her house! I love that kind of response, don't you?? Speaking of gifts...I bought a digital camera for my friend, Charlotte (one of the CL's). 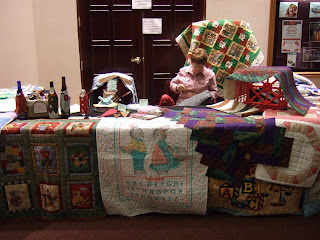 We had the opportunity to take all the left over quilts and things we had from the craft show at the church to the Cherry Hill Village Theater to try and sell more. They were hosting a Christmas Spectacular on Thurs, Fri, 2 on Sat and one on Sunday and the woman that runs the theater asked us if we would like to set up and try to sell some more there. Well, you don't have to ask me twice. We got a few people to man the booth and last night was my turn. Well, Charlotte didn't want me to have to work alone so I picked her up and we went together. We sold $100 on Sat night. I think the others have done almost that each time too so it is definitely worth the effort. Charlotte and I had bindings to do so we worked on those and there was a TV in the lobby so we got to watch the show from there. Anyway, after the show I brought her home and went in and first she gave me my present. It was a wonderful pair of Gingher scissors!! I love these scissors. She knows me so well. It was then I gave her her present, a digital camera. She was so thrilled. I have been waiting for them to go on sale as I knew I wanted to get one for her. I was looking to spend under $50 and finally I found one. (I won't say for how much as I know she reads this!) It made me happy to make her so happy!! I got her a 2GB memory card and the waranty plan since I don't know much about the camera brand. 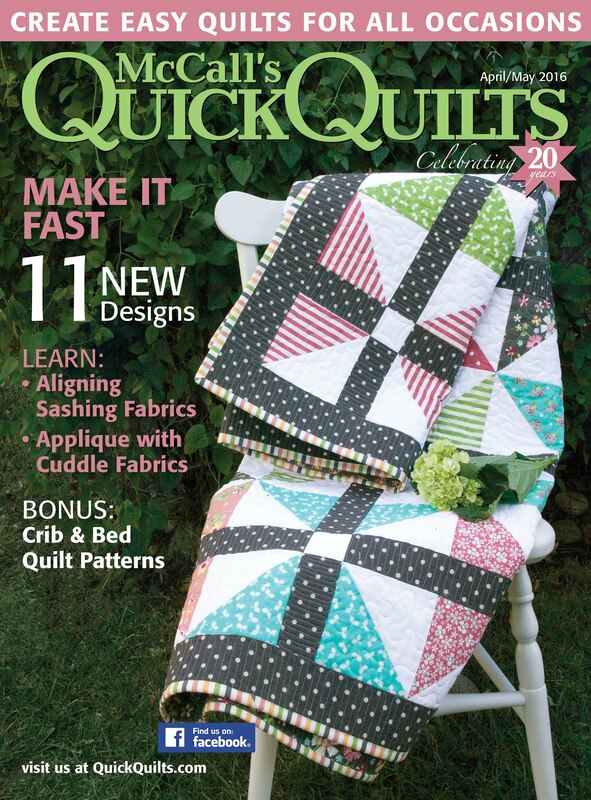 Then over to Marcia's to give her the quilt. Yes, my Santa day was complete!! I told you I would show this and I finally was able to get a photo when DH wasn't around. Isn't it great? DD2 loved it too. I had a Longhorn one commissioned too and will get a photo later. It is a painted glass block with lights inside of it. We had our Christmas party with all the CL's on Tues night. Here they all are (minus me as I was taking the photo!) What a great group of women!! Speaking of wonderful women, this fabulous group of pressies was sent to me by my friend Faith who lives in the UK. Isn't that bunny the cutest little thing? 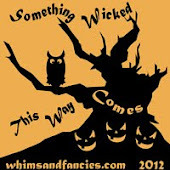 For those of you that remember Witchy Woo (the Halloween quilt Faith made) the pin cushion and the little needle holder and bag were made by Faith with bits left over from the quilt. It is so special to me because she painted my cat, Hallie on the quilt! 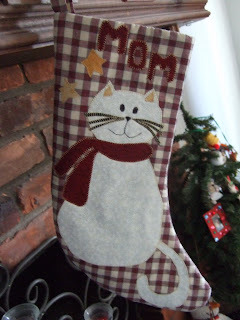 She also sent some fabulous cat fabrics with adorable pictures of cats on them and some with paw prints too. See that little beauty in the lower right hand corner? I think that would make some really great dragon scales too!! She also included some cook books that I am dying to take a look at. (I've been so busy I haven't even had time to open them up yet, but soon!) Faith you are such a good friend and so generous with your time and talent. I feel truly blessed that you are my friend! Thank you so much for the great gifts which I know came from your heart! We are supposed to get a HUGE snow storm tonight 6-10 inches and again on Sunday. I got the Sparty quilt back from LTW and finished the binding last night at the CHV quilt group. It is a good time to do hand work. I have a Christmas Party tonight for my work and that should be fun too. I probably won't stay too late but it is usually a fun day. I was so caught up in what I needed to take to the party this am that I left my sweater at home. I ended up walking in the door here at work dressed all in black!! It is a nice christmas sweater so my friend, that I work with is supposed to drop by my house and pick it up and bring it to the party. 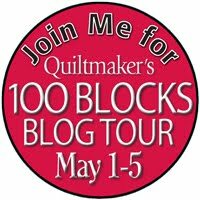 I realize that you probably have all been waiting for the big reveal of Amy's quilt so here it is!! 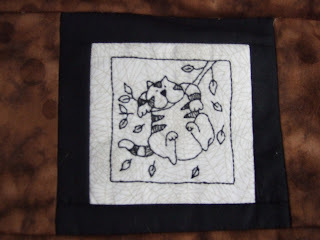 This is the quilting LTW did on the back of the quilt. The thread is aqua and is it ever gorgeous on that black fabric! 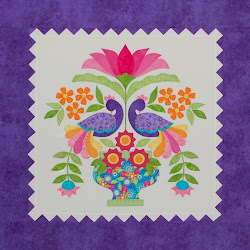 You can see the beautiful batik border I chose. I knew I wanted to work with purple aqua and green so found this fabric to go with. 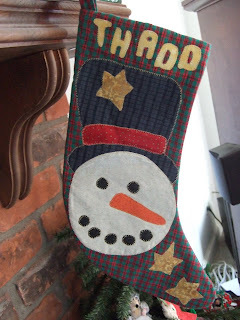 You can see that LTW used a variegated thread on the top with purple, aqua and green, perfect dontcha' think? I love how she did the block work to fit in the pattern the bright lines formed rather than in the actual blocks, clever huh? Here is a photo of the entire quilt all finished. It doesn't even come close to portraying how beautiful the actual finished quilt really is. It is quite spectacular. DD1 thinks it should be hers and I really struggled with that as it really is beautiful. Then I found a piece of fabric while looking for something else that DD1 had actually chosen and it is in colors that would work with this quilt. Sign number 1. 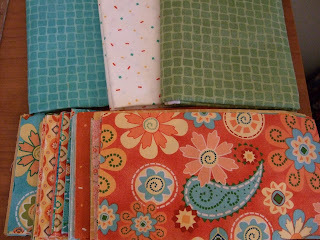 I went to the Quilt Patch on Saturday and found the border fabric and lots of beautiful batiks in these colors too. Sign number 2. Who am I to ignore what I'm being told to do? So this will indeed go to Amy. My dilemma now is when to give it to her? I am thinking college graduation which should be next year, and I know that's the right occasion, but I don't want to hold on to it and store it for the next year and I really, really want her to be able to use it now. Let me know what you all think I should do. Sparkle Bear, the quilt, is complete. I only need to put my stamp on the label and it will be all finished. I think it turned out so cute! I love this pattern. It's called the Five Yard Quilt Pattern. You can really see the quilting here. 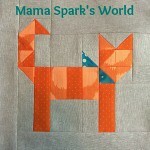 Many of you know the story behind my name, Mama Spark. My DD's friends call her Sparkle so I am mama of Sparkle aka Mama Spark. 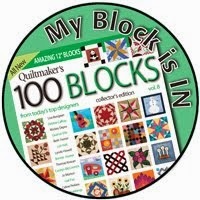 This quilt was made for my neighbor that is like another mum to my DD1. We moved in across from them when DD1 was 18 months old. We have 2 girls and they have 2 boys and they are all the same age, then we had another boy, but that's another story! So the kids all grew up together and are still good friends. But my friend and my DD1 have bonded. My friend, Marcia, just loves Polar Bears. She is mama bear to my DD's baby bear. This is where the Polar Bear fabric came in. I saw it and thought it would be the perfect thing to make a table runner out of...until DD saw it and said, "I'm sure she would much rather have a quilt". Well, duh...who wouldn't? So I found one of the easiest and quickest patterns I have and made this in about 8 hours, from cutting to piecing the back. You gotta love that! I am happy with how it turned out. I am thinking about waiting to give it to her very close to Christmas. Why you ask? Because we do not normally exchange gifts and I don't want her to feel obligated to get something for me. I did this because I wanted to not to get anything back. So that being said...I have sent out some packages to several of you for Christmas too. Please do NOT feel obligated in any way to reciprocate. I did it because I wanted to, because I found things I thought you would like and that would make you have a happy day. Please enjoy them in the spirit that I have given them. (But let me know when you receive them) Now, Annemiek, no harassing the post man!! On another note, I got Amy's quilt back from LTW today and it is AMAZING!!! The Bestest quilt yet. I am considering doing something different with it and making the same quilt again to give to Amy closer to her college graduation. Oh, never fear, I am not going to keep it, it will just go to someone else. I can't tell you who as that person reads this blog occasionally. Have a great day and keep stalking the postman! 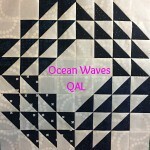 I will post pictures of the new quilt soon! Well, I guess I'm a slacker! I wasn't able to get photos of everything last night but I did get a couple so that will have to do for today. I am still at work and it is late and I need to go and mail something to The Netherlands, so this will be short! Here is the tree DD1 made in 4th grade. I was so happy to get the replacement bulbs. I was trying to get a photo of the glass block but DH ended up home and by the time I got home from quilting with the ladies I couldn't take it out for a photo. Here you can see my quilt inspector, Hallie. It is the Polar Bear quilt but you can't see it because she is busy "inspecting" it! Quality control dontcha know?! I got the binding about 3/4 finished so will try to finish it tonight at the CHV quilt group. I might even get the label on it, who knows? 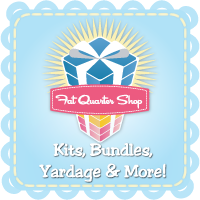 Quilts, Quilts and More Quils! I guess if you ask me I would have to say this is probably the second "quilt" I ever made. See the lovely Aiden as she sheds all over it for me? No one is completely dressed in our house until you are dressed with cat hair! But I digress. It is a tree skirt. 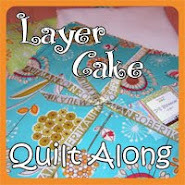 I did not know how to "quilt" back in the day so it was tied. We still use it every Christmas. 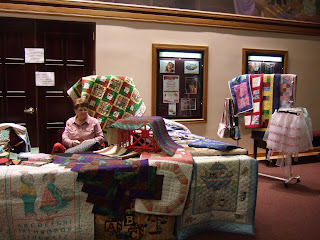 More photos of the quilts from the raffle. Let me know if you want to buy tickets. The drawing is on Friday! Now for some real excitement!! 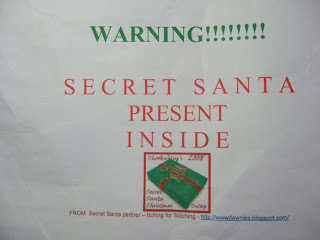 I received my package from my SS in the CookyBlue Secret Santa Christmas Swap (SSCS). She is from Australia and her name is Dawn. Hi Dawn!! I am so very excited to see what it is but as you can see I have placed it under my tree and will NOT open it until Christmas! This weekend was the church craft show with the CL's. I think we did pretty well all things considered (the economy and the snow storm!) Here are some pictures of our booth. We had LOTS and LOTS of things to sell! Smile Stacy you are on my blog now!! I bought some really neat things at the sale. I'm sure most of you know what glass blocks are right (replacement window type things) well some clever person figured out that you can drill a hole in the side and shove Christmas lights inside. Then you can decorate them. I did this a few years ago and just made them look like presents with a beautiful bow on the top. A woman had used glass paint and painted on them at this show. So...I bought one with the MSU block "S" on it. I will take a photo when DH is gone so you can see it, but it is for him for Christmas. You know what? I was going to tell you all about what I bought but I will take some pictures tonight and tell you about it tomorrow, okay?? It will be so much more interesting that way! 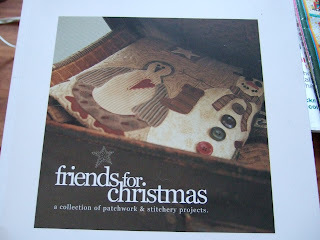 Except I can't show everything or tell everything as some of it is now winging its way to fellow bloggers. Maybe it's going to you? Both girls came home on Wednesday to help me clean and do some cooking. We went to my nephew's for the actual dinner on Thursday. I asked him what he was planning on serving for appetizers and he said, "I thought since there aren't many people coming that I would put out a bowl of nuts". Really?? NO! My girls would cry if they didn't get the regular things I make at home. So DD1 helped me on Thursday morning make all the dips and I made the pumpkin pies on Wed night. We all ended up at my nephew's house along with my dad and sister. We had a great time. Have you ever played Catch Phrase? What a riot!! I have never seen my DH laugh so much! In addition, I gave my sister her quilt. I know, I know, *finally* right? She cried! Perfect reaction!! DD2 and I were geared up for shopping on Friday and the boys were going to go deer hunting, again, perfect! We went out and got our bargains and we had a blast. It isn't the beginning of the season without stalking someone for their parking space!! Friday we cleaned and got ready for getting all the Christmas decoration out on Saturday. Saturday was a beautiful sunny day. Actually not too cold either. DD2 (and reluctantly DD1) helped me get all the decorations up, the tree up and the lights on it and the outside decorations done too. We hang cedar roping up with white lights and red bows. It is so pretty. I usually have to do it by myself but this year I had lots of help! I did the whole thing wearing a sweatshirt and even could have stripped to a t-shirt, I think it must have been in the 50's. Bonus! When Dh and DS came home (no deer) weren't they in for a surprise? I had bought some polar bear fabric and some companion fabrics to make a something for my neighbor that is like a second mom to my DD1. This neighbor loves polar bears. I was unsure of what to try to make with it and DD1 thought a table runner or tree skirt was not the right thing, so, "hey mom, I bet she would like a quilt". Really, you think so do you? 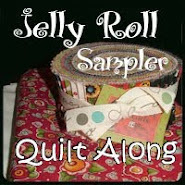 Cuz I had nothing better to do than to design a quilt and get it to the quilter before Christmas, right? That's exactly what I did. I used the 5 yard pattern that I used to make the MSU quilt for the raffle and including making and eating my dinner had the quilt top and back finished in about 9 hours (cutting and all). I think I did a couple other things in between like let the dog out and do the laundry. Of course I handed it off to LTW this am and so have no photos for you! It turned out really good though, lol. LTW promised to get it back to me soon so I hope to have some pictures for you before too long. I hope you all had a good weekend too. I am certainly thankful for my beautiful, helpful daughters! I have never had my Christmas decorations up this early before so I feel pretty good about that.